Florida reuses roughly half of its treated wastewater, or 725 million gallons per day – the most of any state. It has been one of the top-ten fastest-growing states over the past decade. Maintaining adequate freshwater supplies for development, consumption, and tourism is a major challenge. The city of St. Petersburg Water Resources Department was created in October 1975 when the city’s water and sewer departments merged. Water resources – the largest of St. Petersburg’s enterprise operations – provides potable water distribution; wastewater (sewage) collection, treatment, and disposal; and reclaimed water for irrigation purposes to city residents. 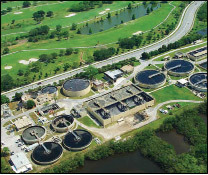 The Water Resources Department has been honored numerous times for excellence, including multiple receipt of the Florida Deptartment of Environmental Protection’s (Southwest District) Excellence Award for Outstanding Operation, and the American Water Works Association’s Outstanding Water Treatment Plant Award. Steven Leavitt joined the city staff as a member of the Engineering and Capital Improvements Department in 1999. He is now the director of the Water Resources department. His responsibilities include overseeing the treatment and distribution of potable water, overseeing collection and treatment of wastewater, and distribution of reclaimed water for residential lawn irrigation. Steve is a member of the American Water Works Association, the Water Environmental Federation, and the American Public Works Association. Steve said, “The Water Resources Department continues to develop and disseminate a variety of educational outreach materials to support water conservation, water quality, and efficient reclaimed water use efforts. Our customer service responsibilities include reaching out to residents and homeowners’ associations so we can all be better stewards of our most precious resource. Christine Claus, coordinator of Water Conservation, is working with St. Petersburg staff members and its partners to facilitate assisting customers to conserve water. The efforts include providing publications, rebates, and giveaway items. Funding is limited for all programs. Details may be found online at www.stpete.org/water or by calling 727-892-5300. Christine collaborated with Joan Bradshaw, Ph.D., University of Florida IFAS, to create a publication that helps people check their own residential sprinkler system. Christine told us, “St. Petersburg residents, business owners, and visitors should be proud to know that since 1990, water customers have reduced their water use from 117 gallons per day per person, to 78 gallons per day… a 33% reduction! St. Petersburg Water Resources Department’s ‘green’ administrative building at 1650 Third Avenue North is the location for a landscaping workshop series. The workshops are 6-8:30pm on the announced dates. Upcoming workshops will be May 14, 21, 28 and June 11, 18, 25. To find out more information for these and other future workshops, call 727-892-5688. St. Petersburg Toilet Rebate Program: Rebate up to $100. For information, call 727-893-7676. 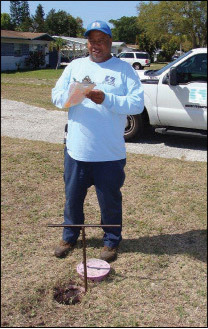 Free Sprinkler System Check-Up: For customers irrigating with potable (city), well, or reclaimed water. You must be a city of St. Petersburg water customer. Apply by calling 727-551-3177 for an application. Water Conservation Publications: To find out what publications are available and to request them, call 727-892-5020 and leave contact information. Restaurant Spray Valve Replacement Program: For information, call 727-551-3177. Indoor Water Conservation Kits: To receive a free kit, water customers should bring their utility bill to the Water Department at 1650 3rd Avenue North, Monday-Friday 7:30am-4pm and fill out a form to pick up the kit. Public Presentations and Workshops: Specialists are available to speak with community associations and groups on topics relating to water use and conservation. 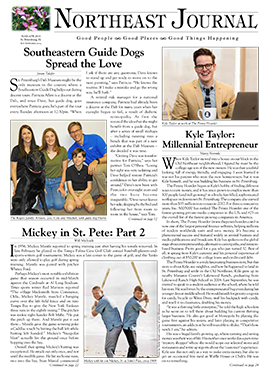 Electronic Newsletter: Water Wise eSplash.Subscribe by visiting www.stpete.org/StayConnected. 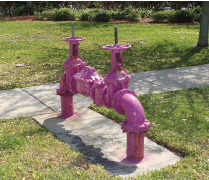 The city of St. Petersburg has clearly led the way in its initial use of reclaimed water in the United States. Its water conservation initiatives played a vital role in helping it become the first Florida city to attain Silver certification as a Green Local Government in 2007. We thank the St. Petersburg Water Resources Department for their important contributions in relation to our use and conservation of water!